It’s never too early or too late to start socking money away for your golden years. True, the earlier you start, the more compounding your money will enjoy. But if you start later, chances are your income will be higher so you can stash away more in that shorter period of time. Although everyone’s time table for when they retire is different, in today’s world, “retirement” is being given new meaning. Of course, there are still those folks who will work for 45 years, saving along the way, and then one day call it quits at age 65 and move to Florida to watch the sunset. Regardless of your ideas on how to retire, putting money away is the critical objective. Here’s a great chart that can help visualize how much money you need to save monthly for 25 years to reach certain thresholds. Some of us might still have 25 years left to save, while others might not. If you’d like to play around with the numbers a bit more and input your own timeframes and rates of return, here’s another great tool. But saving money is only part of the retirement plan. Investing some of your savings in the right way will play two even more important roles. First it will influence how much you’ll have when it’s time to tap into it. And second, it’ll determine what income you can generate in retirement. There are many ways to invest your money — stocks, bonds, CDs, commodities, gold, real estate, etc. 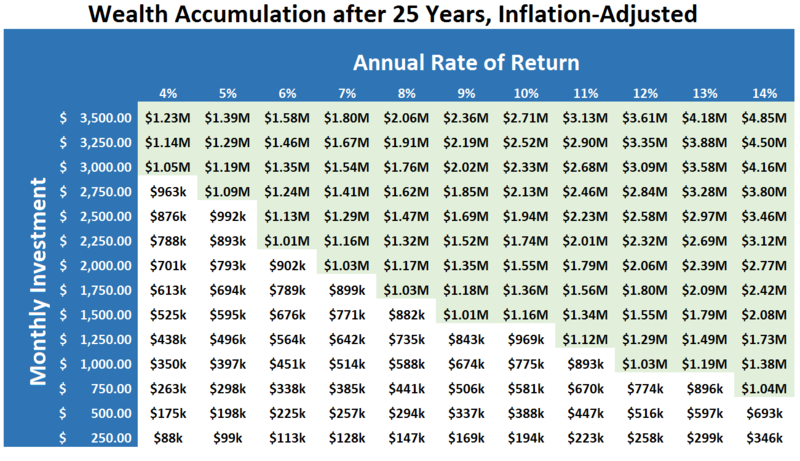 Depending on what chart and time period you look at, you could make a case for all of those investments being the best at one time or another. But in the long run (50 years or more), I believe the stock market has produced the best results, with a long-term average annual return of around 7%. Of course, there are ways to juice those returns by picking certain stocks, especially ones that pay out high dividends. Dividends are part of a company’s profits that are given back to the shareholders. You can reinvest those dividends, or you can take the cash and invest in other stocks. Owning quality dividend stocks is a fantastic way to generate income for your retirement. You can also use today’s “gig economy” to pad your account even more. The gig economy is a generalized term used to describe today’s entrepreneurial landscape in which any person can come up with a new idea or way to make money. These “side hustles” are almost endless. Some of the more popular ones include renting out your house or a spare room, a la Airbnb or renting out your idle car, a la turo.com. You could become a dog walker, personal shopper, babysitter, tutor, anything your imagination can conceive, really. If you’re interested, here’s a quick look at 99 Side Hustle Businesses you can start. In my opinion, it’s one of the best ways to generate income at any age. I’ve discussed many ways in which to use options, one of which is the mainstay of my successful Instant Income Alert newsletter. But since this is National Retirement Week, a solid play to use options in an IRA is by selling covered call options. I wrote about this very subject just last month. Did you know you can “rent” out your stocks just like your house or car? That’s exactly what selling covered calls is like. You’re giving someone an opportunity to buy your stock shares from you at a much higher price than where they currently trade. In exchange for that opportunity, they will pay you an upfront fee. If the stock never reaches the desired level, the option contract expires and you retain your shares (and the upfront fee). You are then free to rent them out again. If the stock does reach the threshold by expiration, then you will give up your shares at the agreed-upon higher price. The sale should assure you a nice profit from the price appreciation. One caveat though: make sure you’ll be comfortable letting go of your shares at the agreed-upon price as the stock can continue to move higher after the sale. If you stick to choosing price levels that have a low probability of being reached, then the chance of giving up your shares will be very small. You can use a probability calculator like this one to help you decide. That’s all from me for this week. Here’s to making retirement easy!